I first read A Woman of the People for an assignment in my 7th grade English class in San Antonio as part of our Texas literature unit. I loved it then. I really did. And I wasn't expecting to. I had recently moved to the Lone Star state from the island of Sicily and things were . . . a little different. Which is a really understated way of saying I was hopelessly unequal to the task of handling the differences between living in Italy and living in Texas. On top of that it was 7th grade, and 7th grade, as you know, is hell. I wasn't comfortable in my own skin. I wasn't comfortable back in the states. And I certainly wasn't comfortable at the middle school with its walls that felt as though they were closing in on me a little closer and a little tighter every day. So a book set on the Texas frontier didn't exactly have my engines racing, you know? Fortunately, I started it anyway. And that was all it took. Just starting it. I've re-read it a couple of times over the years since. For awhile there at work, I was conducting quite a bit of research on the history of Native American tribes and their interactions with early settlers. That research reminded me of this book and I discovered my old copy had gone walkabout. But I couldn't shake the urge to pick it up again, so I managed to find a copy to reread. It was as wonderful and heartbreaking as I remember it being. I feel like I say this more than I'd like, but I don't think I've talked to a single soul (outside of that 7th grade class) who's read this book and that's a shame. It deserves a wider readership than a handful of reluctant 7th graders. Helen Morrison is nine years old and her little sister Katy is five. Living with their parents and their older brother George near the Brazos River on the Texas frontier, Helen and Katy's lives are practical but airy. They play and work and dream, and when Helen can't sleep at night she keeps herself up with stories of the scariest thing she can imagine--the Comanches. But while she believes they're real (even though she's never seen one), her young mind cannot really conceive of the terrible warriors her Aunt Melinda whispers of so threateningly. Then one fall day the Comanches come. The tribesmen destroy the Morrison homestead, killing the parents and older brother and carrying the two young girls off captive. In shock, angry, and determined to escape and return back home, Helen puts all her energy into taking care of Katy and not giving an inch to the people who have shattered her life. She soon becomes known among the tribe as Tehanita, or Little Girl Texan, and over the course of the next fourteen years she slowly (almost unbeknownst to herself) becomes assimilated into the Comanche tribe, finding family, companionship, and love among the people she once feared and distrusted. I love Helen's story. I think my 12-year-old self, struggling to bridge two different cultures, found a lot to resonate with in her anger, fear, and uncertainty. I had read several traditional captivity tales around that time (Calico Captive comes to mind), and this one held the allure of being based on a true story. Interestingly, re-reading it as an adult, I relate to the story just as well as I did then, albeit this time more along the lines of the pain associated with actually being a grown up, leaving the world of childhood and home behind, and the wonder and joy of finding family where you didn't expect to and people who take you in and love you when they don't have to. I especially appreciated the emphasis on transformation and the many different roles we fill over the course of our lives, whether we go in willingly or not. Helen goes from scared young girl to Tehanita to a woman of the people, but her final role as Story Teller for her people may be my favorite. And I will always love the ways in which she is loved and taught by her adopted family Lance Returner and Come Home Early, Old Woman and Blessed. And of course by one unusual young man who falls in love with the outsider and the grand gesture he makes. I was and remain enchanted by the beautiful chapter titles: Mountains That Wander Away, The Winter of Living in Graves, and West Toward the Setting Sun. 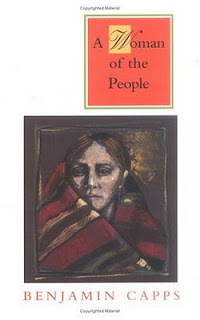 Strong and bittersweet, A Woman of the People is a beautiful narrative and one that should not be forgotten. What a great review! I just bought a paperback copy online. It sounds like it's based on the same story that inspired The Searchers (the movie), but is vastly more interesting because it's from her point of view. Great review! I really like the sound of this book, will have a look for it on amazon. Thank you for reviewing this book! 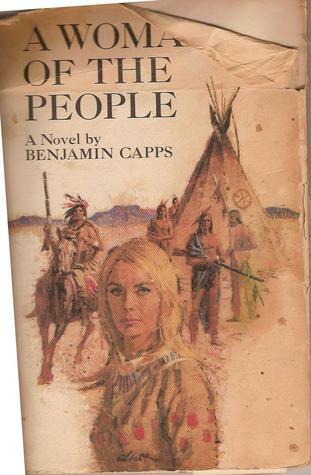 I am always looking for new books about Native Americans, especially the Plains tribes. Have you read Only Earth and Sky Last Forever? It takes place during the Battle of Little Big Horn. Highly recommended! Elizabeth, oh wow. I'm thrilled you purchased a copy. An you're exactly right. I'm pretty sure it is the story that inspired The Searchers. Willa, thanks! I was happy to see it's still in print. I was a bit worried since I don't hear much about it. Maniac, my pleasure. It was on my mind lately and fit the bill. I haven't read ONLY EARTH AND SKY LAST FOREVER. Love the title. Will have to check it out. Thanks so much for the rec! It sounds like a lovely book! It's always nice when you find a favorite in school. Gives things a nice change. If you don't mind my asking, how old were you when you lived in Italy? I also lived abroad for awhile when I was young, but unlike you, I hated it! I loved returning to the states (although middle school was indeed hell, even at home). I'm jealous of what sounds like a wonderful experience you had in Europe. I believe I once read you found comfort in Tamora Pierce when you moved back to the states--for me it was the opposite. I found Tamora Pierce when I lived in Europe. Alanna, Daine, and Kel were a most welcome comfort there. Lizzy, I was 10-12. And it was hard going over initially, but I adjusted and it was such a wonderful experience. Both my parents speak Italian, however, and so we were really immersed in the culture and lifestyle there. That's fascinating that you discovered her when you were in Europe. I did find her back stateside, in San Antonio, in fact. It was a good place for books, if a hard place to adjust to.